A 1955 Porsche 550 Spyder (est. €2.8 to €3.5 million) and a 2004 Enzo Ferraris are the early highlights of the 2016 RM Sotheby’s Paris classic car auction. The sale during Rétromobile week will also feature a 1955 Mercedes Benz 300 SL Gullwing and the 1989 Ferrari F40 that originally belonged to Stefano Casiraghi, the second husband of Princess Caroline of Monaco. RM Sotheby’s will have its third annual sale in Paris during Rétromobile week in 2016. This classic car auction will be on 3 February 2016 at Place Vauban after the Festival Automobile International display of beautiful concept cars from 3 December 2015 to 31 January 2016. A rare 1955 Porsche 550 Spyder is the early leading star car for the RM Sotheby’s 2016 Paris classic car sale. This Porsche 550 Spyder, chassis no. 550-0068, was shown at the 1955 Frankfurt Motor Show and was raced in period in North America. 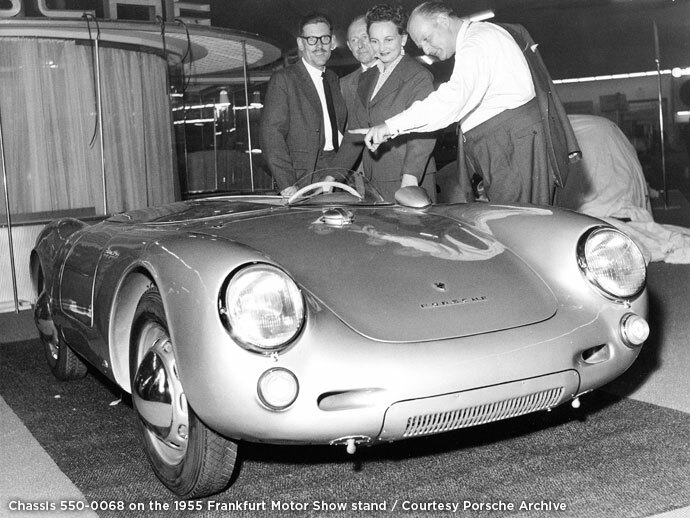 Although based on the 356, the Porsche 550 Spyder was designed specifically with competition in mind. It thus had more potent mechanicals as well as a more aerodynamic low-slung body. The pre-auction estimate is €2.8 to €3.5 million. The same auction will also have a 1955 Porsche 356 Pre-A Speedster by Reutter on offer (Est. €250,000 – € 300,000). The 2004 Ferrari Enzo (estimate $1.5 to $2 million) is currently the leading Ferrari in the RM Sotheby’s 2016 Paris sale. The car is finished in Nero Daytona over red “Cartier” upholstery. It features further special specification including a carbon wing and mirror, tinted windows, Enzo monograms and an Alpine GPS and audio system. The car has only covered 2,500 km since new. Almost every current collectors car auction features an F40 but the 1989 Ferrari F40, chassis no. 80161, (estimate €1 to €1.2 million) on offer by RM Sotheby’s at Paris 2016 comes with a well-documented history. The car originally belonged to Stefano Casiraghi, the second husband of Princess Caroline of Monaco. She apparently thought the car dangerously fast and had him sell the car after only two months. The Ferrari F40 has been in single ownership for the past 26 years and has covered only 4,300 km since new. Like the F40, Mercedes Benz 300 SLs cars feature frequently in classic car auctions and selling usually between $1 and $2 million. The 1955 Mercedes Benz 300 SL Gullwing (estimate: €1.200.000 – €1.600.000) on offer is in fully restored condition.